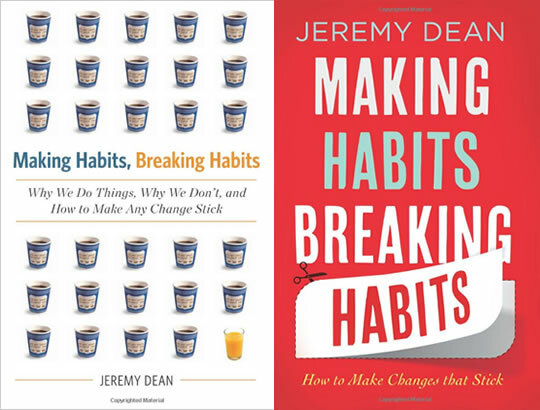 New book about habits forthcoming from PsyBlog’s author, Jeremy Dean. I’m very pleased to announce that I have a new book coming out in a few weeks time called Making Habits, Breaking Habits: How to Make Changes that Stick. The book will be published as a hardback in the US (above left; 1 Jan 2013) and a paperback in the UK (above right; 3 Jan 2013). It will also be available as an ebook through all the usual retailers. “Say you want to start going to the gym or practicing a musical instrument. How long should it take before you stop having to force it and start doing it automatically? The surprising answers are found in Making Habits, Breaking Habits, a psychologist’s popular examination of one of the most powerful and under-appreciated processes in the mind. Although people like to think that they are in control, much of human behavior occurs without any decision-making or conscious thought. Drawing on hundreds of fascinating studies, psychologist Jeremy Dean busts the myths to finally explain why seemingly easy habits, like eating an apple a day, can be surprisingly difficult to form, and how to take charge of your brain’s natural “autopilot” to make any change stick. I will tell you more about the book over the coming weeks. To ensure you get the latest information, why not sign up to get free email updates from PsyBlog. This will send you an email every time PsyBlog is updated. → You can order the book now on Amazon.com or Amazon.co.uk.